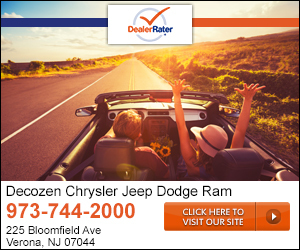 At Decozen Chrysler Jeep Dodge we believe that everyone should be treated like a VIP. This philosophy translates to exceptional service, money saving specials, and the latest new and pre-owned inventory selections. Come down today and experience preferential treatment. Browse our new and used inventories in a friendly and calm atmosphere, and speak with our financial staff to learn about your financing options. Be sure to check out the latest specials for current promotions and incentives; your next new vehicle is right around the corner! If you have any questions related to inventory, service, parts or financing, feel free to call us at (877) 554-4129 and speak with one of our friendly staff members. Someone is sure to have an answer for you! "Easiest and best car buying experience there is! " Awesome people at DeCozen. Everyone we dealt with were amazing and helped us with everything we needed! Couldn’t have had a better experience anywhere! I was able to get my dream car because of them. Couldn’t ask for more! Jerry at Decozen was great. No games or gimmicks everything was exactly as described and I was able to get a great vehicle at a great price. Joe in the finance department was excellent as well. "Great salesman with a lot of patience!" Turned in a lease vehicle and purchased a used vehicle. Was at the dealership a good part of the day and have to commend salesman Roberto Milton for his customer service, patience and professionalism. Thank you!